The American presidential nomination process gives enormous influence to two small and, in many ways, highly unrepresentative states: Iowa and New Hampshire. Not only are Iowa and New Hampshire sparsely populated states without any major metropolitan areas — Des Moines is the 89th largest metro area in the U.S. and Manchester is the 131st largest — but both are populated overwhelmingly by non-Hispanic whites in a country that is becoming more and more racially diverse. Even the Democrats in Iowa and New Hampshire are overwhelmingly white, and that is very significant politically in 2016. Despite their small populations, tiny numbers of national convention delegates and racially homogeneous electorates, the national parties continue to allow Iowa and New Hampshire to exert an outsized influence on the selection of the presidential nominees by kicking off the primary and caucus season. Because they go first and second, the national media provide massive coverage of the contests in these two states. This means that what happens in Iowa and New Hampshire can influence the opinions of voters in the rest of the country and, therefore, the results of later contests and the eventual outcomes of the nomination races. The last candidate to win a major party nomination without winning in either Iowa or New Hampshire was Bill Clinton in 1992. He finished second in New Hampshire, declared himself the “comeback kid,” and went on to win the Democratic nomination. 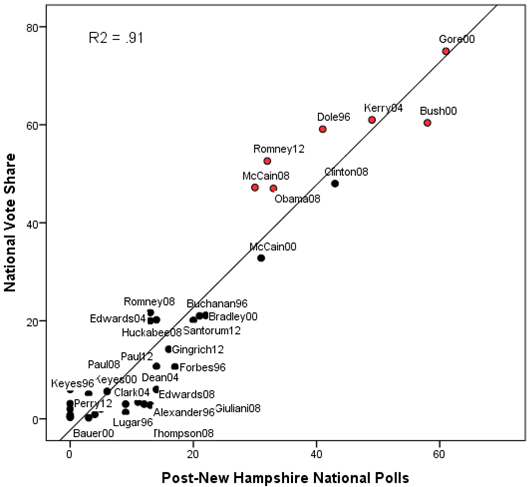 The influence of Iowa and New Hampshire on the presidential nomination process can be seen by examining how their results affect the standing of the candidates in the national polls. Even though there is no national primary, the national polls do eventually provide an accurate prediction of the final nomination results. Figures 1 and 2 show the relationship between the total vote in all of the primaries and the national polls before the Iowa caucuses and after the New Hampshire primary for every contested nomination contest since 1996. The total primary vote is very important because in the post-reform era of presidential nominations, the winner of the total primary vote almost always wins the nomination. Candidates who went on to win their party’s nomination are shown on this graph with red dots. The only candidate since 1996, and indeed the only one since 1976, who won a major party nomination without winning the most votes in the primaries was Barack Obama in 2008. Obama won slightly fewer votes than Hillary Clinton in Democratic primaries that year but won more delegates because he decisively defeated Clinton in the caucus states. 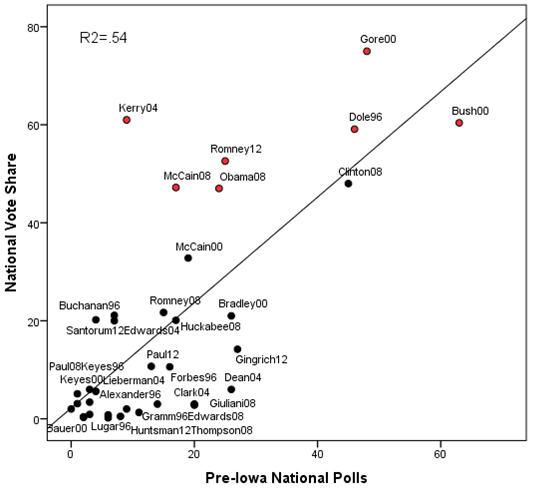 The results displayed in Figures 1 and 2 show that support for candidates in the national polls goes from being a fairly weak predictor of the national primary vote before Iowa to a very strong predictor after New Hampshire. Thus, while only three of the seven candidates leading in the national polls before Iowa went on to win the nomination, six of the seven candidates leading in the national polls after New Hampshire went on the win the nomination. And the only post-New Hampshire poll leader who did not win the nomination, Hillary Clinton in 2008, did end up winning the largest share of votes in the primaries. Note: Based on contested primaries. Second-place finishes included only in contests with three or more candidates; third place finishes included only in contests with four or more candidates. The data displayed in Figures 1 and 2 show that what happens in Iowa and New Hampshire can dramatically reshape the presidential nomination race. 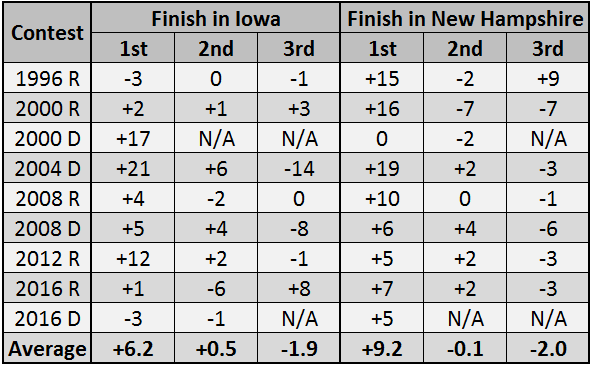 How this happens can be seen in Table 1, which displays the change in national poll support for the candidates finishing first, second and third in each contest since 1996 including the 2016 Iowa and New Hampshire contests. These results indicate that winning in Iowa and especially in New Hampshire can give a candidate a substantial boost in the national polls. Seven of the nine Iowa caucus winners and eight of the nine New Hampshire primary winners during this time period saw their national poll numbers rise. The average gain in support was just over six points for Iowa caucus winners and just over nine points for New Hampshire primary winners. On the other hand, finishing second or third in Iowa or New Hampshire did not, on average, give candidates a boost in the national polls. While the results in Table 1 show that candidates who win in Iowa and New Hampshire typically enjoy a boost in their national poll standings, they also show that the effects have varied dramatically from election year to election year. Thus, while John Kerry saw his national poll numbers jump by 21 points after winning the Iowa caucuses in 2004 and by another 19 points after winning the New Hampshire primary, this year Ted Cruz’s support fell by three points after winning the Iowa caucuses. In fact, the candidate who made the biggest gain in the national polls this year was Marco Rubio, whose support rose by eight points after finishing third in Iowa. The variability in the impact of winning in Iowa and New Hampshire on the national polls suggests that these effects are mediated by the way the results are interpreted by the national media. How much of a boost a candidate gets from winning in Iowa or New Hampshire may depend on how much additional media coverage that candidate receives as well as the tone of that media coverage. This may depend, in turn, on whether the winner is portrayed by the media as doing better or worse than expected before the caucus or primary. Thus, Rubio may have gained support in national polls following his third place finish in Iowa this year because his showing was widely described as exceeding expectations in the national media. An examination of the combined effects of the Iowa caucuses and the New Hampshire primary on the national polls up to this point shows two significant trends: Donald Trump appears to have widened his already substantial lead in national polls of Republican voters, and Bernie Sanders appears to have significantly narrowed his deficit in national polls of Democratic voters. Heading into the South Carolina primary, Trump leads his nearest competitor, Cruz, by a margin of almost 20 points. Meanwhile, Sanders appears to have cut Hillary Clinton’s margin in the national polls from about 15 points before Iowa and New Hampshire to around 8 points in post-New Hampshire polling. These trends suggest that Donald Trump should be considered a solid favorite to win the Republican presidential nomination. Since 1996, no candidate leading by such a wide margin in national polls after the New Hampshire primary has failed to win a major party nomination. The only caveat here is that Trump is a very unusual Republican frontrunner. No Republican frontrunner since Barry Goldwater in 1964 has generated anything approaching the level of resistance among Republican Party leaders and elected officials that Trump has generated. So far, however, their resistance has had little impact on GOP voters, partly because the party “establishment” has been unable to unite behind a single alternative to Trump and partly because many of these party leaders and elected officials dislike Ted Cruz even more than they dislike Donald Trump. The results of the South Carolina primary on Saturday and the Nevada caucuses three days later should provide further evidence about whether Trump’s march to the GOP nomination will continue unimpeded or suffer a serious setback. Based on the most recent polling in both states, the former seems much more likely than the latter. On the Democratic side, things look very different. While Hillary Clinton continues to hold the lead, based on the results of the most recent national polling she can no longer be considered the prohibitive favorite to win the Democratic nomination. However, whether Bernie Sanders can continue to cut into Clinton’s lead and become the frontrunner himself will probably depend on what happens in the next two tests for the Democrats — the Nevada caucuses on February 20 and the South Carolina primary on February 27. The history of the Nevada caucuses is too short to estimate how their results may affect the trajectory of the Democratic race. Recent polling suggests that the contest between Clinton and Sanders is very close, but polling is very difficult in a caucus state with a very low turnout like Nevada. Moreover, whatever impact Nevada has on the Democratic race is likely to be drowned out one week later by the results in South Carolina, which will receive extensive national media coverage. 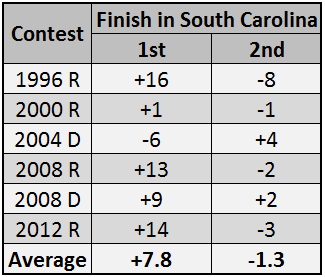 South Carolina will be a key test for both parties because, as the data in Table 2 show, winning in South Carolina, like winning in Iowa and New Hampshire, can give a candidate a substantial boost. The winner in South Carolina has gotten such a boost in five of the six most recent competitive contests — the only exception was John Edwards in the 2004 Democratic primary but Edwards’ victory was almost totally discounted by political commentators because of the home state advantage he enjoyed as a native South Carolinian. The 7.8 point average gain in support for the winner in the national polls following the South Carolina primary is slightly smaller than the average gain for the winner in New Hampshire but slightly larger than the average gain for the winner in Iowa. With Edwards removed, a win in South Carolina was worth slightly more than a win in New Hampshire. Note: Based on contested primaries. Second-place finishes included only in contests with three or more candidates; third place finishes included only in contests with four or more candidates. 2000 Democratic primary was not contested. According to recent polling in South Carolina, Hillary Clinton is a strong favorite to win the Democratic primary — she currently leads by an average margin of more than 20 points. And based on the data in Table 2, a big win in South Carolina, especially if it follows a win in Nevada, could well restore Clinton’s lead in national polls to something closer to what it was before Iowa and New Hampshire and reestablish her position as the clear favorite to win the Democratic nomination. On the other hand, a relatively narrow win for Clinton in South Carolina, especially if it follows a loss in Nevada, would probably mean that the battle between Clinton and Sanders will be similar to the battle between Clinton and Obama in 2008 — protracted and nasty.